Ingredients : Extract of Bhringraj, Brahmi, Amla, Aloe Vera, Grape Fruit, Tulsi, Guava, Mulberry, Nagarmotha, White Turmeric, Gotu Kola, Jojoba Oil, Almond oil, Virgin Coconut oil. I don't like to use heavy hair oils that weigh down the hair and are difficult to wash off. But then, I got this beauty which I just have to keep for 30 minutes and then rinse off! This natural hair oil comes in a nice looking bottle but sometimes, the product might just leak if you don't put the transparent cap given inside properly. It has a very herbal fragrance because it is a herbal hair oil! It smells like heavy, sticky oils but then the smell is not that strong. It smells like the oils my mother used to apply on my hair. That is why, I am familiar with the fragrance and it does not bother me much. It is slightly bluish-grey in colour. The best part about this hair oil is that it does not contain any harmful chemicals or any colours. It is totally natural and does not contain any mineral oil too! I just wish they has put up the whole ingredients list on the bottle. But what I can see from the key ingredients list is that it actually contains a lot of goodness. It contains Aloe Vera, Amla, Bhringraj, which are all very good for the hair and scalp. I do not suffer from major hair loss or severe hair falling out but this hair oil makes sure to nourish my hair and scalp in the shortest time possible. I made sure to oil my hair at-least thrice a week while experimenting with this oil and yes, it is very easy to rinse off. I have been using this for a couple of weeks now and I have actually seen that my hair feels a bit better and not weighed down. But for significant results I need to use this for few months. It is a very light hair oil, which my daughter also likes to use. It does not feel too greasy. 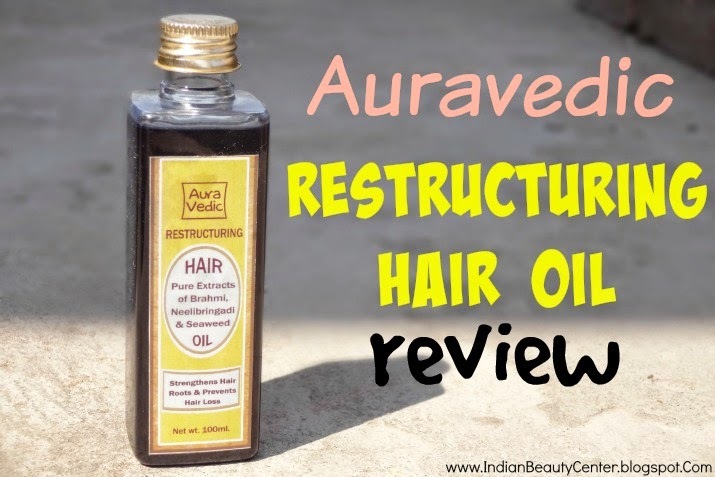 So, I overall liked this hair oil and would suggest that you try it for at least 2 months to see significant improvement or significant hair regrowth. It does make my hair soft, shiny and radiant but then it lasts only for a few days. Our environment has become a bit harsher so make sure to oil your hair twice a week, minimum. Your hair would look healthy and will become damage-free! If possible, switch to a sulphate free shampoo and conditioner. Sounds like a nice hair oil.